Unryu Paper is a lightweight, translucent mulberry paper made from the bark of the mulberry tree where long natural fibers can be seen flowing through the paper. 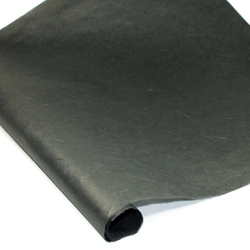 This large roll of Kozo paper features a rich Black color and is both strong and flexible. Unryu paper, commonly referred to as mulberry paper has characteristics of paper containing strands of fiber that are added to the sheet to create contrast and texture. Tear the paper in any shape you desire to create a soft, feathered edge. When layered, mulberry papers are translucent allowing the background colors to mix with the unryu paper. These mulberry papers are a staple for any designer's, artist's or crafter's paper collection. 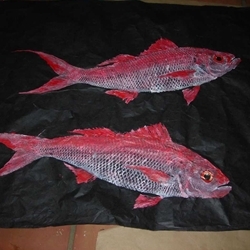 Greg Aragon used Black Unryu Paper rolls as a base for these beautiful and realistic fish rubbings called Gyotaku. Take a look at these outstanding Thai Mulberry Papers. Lightweight Mulberry Fibers are laced together in a lightweight, semi-translucent paper. Compare the tones of the black, brown and natural Unryu Paper.